30% of Canadians take care of aging parents while they're also helping their kids. You've probably heard the term "sandwich generation." It's actually a good metaphor for the kind of financial situation 30% of Canadians1 find themselves in, as they take care of aging parents while they're also helping their kids. And it can be really uncomfortable, to say the least! Caught between these two priorities, it can be challenging to save enough for retirement. Feeling personally responsible for the people you love is commendable, but meeting everyone's needs requires careful planning based on a strategy recommended by professionals. 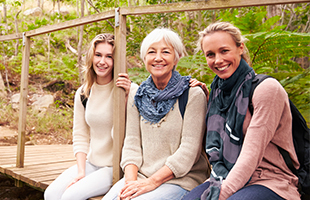 According to Angela Iermieri, a financial planner at Desjardins2, because most baby-boomers and GenXers value family support, they naturally want to help out their kids at important stages of life, like postsecondary education, marriage and buying a first home. But helping out their loved ones can come at a cost to their retirement savings at a time when they should be focusing on this goal. They also experience huge emotional stress from worrying about their kids' future and their parents' wellbeing. That's why it's crucial you don't lose sight of what you need as you help out family members. If you're in that situation, Iermieri advises getting guidance from a financial planner, who will be the voice of reason in helping you with your overall vision and objectives. Financial planning should start early in life, covering your own retirement, of course, but also your kids' education, your desired lifestyle, health insurance coverage, parents' expectations and estate planning. To make it easier for the sandwich generation, Iermieri recommends bringing your parents or kids along when you meet with your advisor. Having a professional will make it less awkward to talk about uncomfortable topics, like money and finances, and allow everyone to share their financial situation, objectives and expectations. "What kind of lifestyle do they want? Can they afford it? Do they want to keep the house or downsize to something smaller? How do they want to help their adult children? These are essential questions, and the answers to those questions will determine what kind of strategy can be implemented to reduce financial stress down the road." "Today, women are waiting longer to have kids, until they're well into their thirties," says Iermieri. "That can delay their retirement savings. Also, kids are living at home longer than before. And according to Statistics Canada, in 2031, 23% of Canadians will be over age 65. Because people are living longer, they need more savings." 2 Financial Planner and Mutual Funds Representative for Desjardins Financial Services Firm Inc.